This genus is accepted, and its native range is Mongolia to N. China. Perennial. Rhizomes elongated. Culms scandent; 50-150 cm long. Lateral branches lacking. Ligule an eciliate membrane. Leaf-blades stiff. Inflorescence a panicle. Panicle contracted. Spikelets solitary. Fertile spikelets pedicelled. Pedicels cuneate. Spikelets comprising 1 fertile florets; without rhachilla extension. Spikelets lanceolate; laterally compressed, or subterete; 10-11 mm long; breaking up at maturity; disarticulating below each fertile floret. Floret callus pilose. 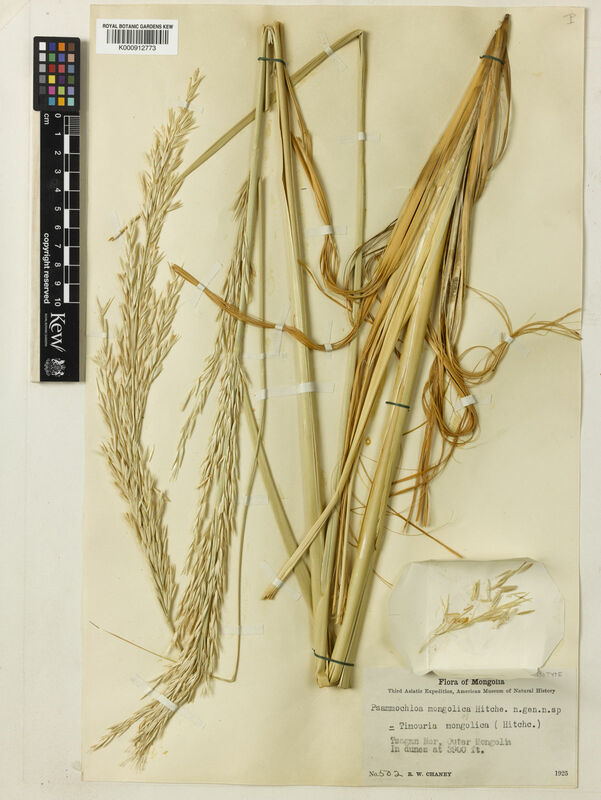 Glumes persistent; exceeding apex of florets; thinner than fertile lemma; gaping. Lower glume lanceolate; 0.9 length of upper glume; membranous; 1-keeled; 5-7 -veined. Lower glume surface scabrous. Lower glume apex truncate, or obtuse. Upper glume lanceolate; 1.1 length of adjacent fertile lemma; membranous; with hyaline margins; 1-keeled; 5-7 -veined. Upper glume surface scabrous. Upper glume apex truncate, or obtuse. Fertile lemma elliptic; subterete; chartaceous; without keel; 9 -veined. Lemma surface villous. Lemma apex dentate; 2 -fid; muticous, or awned; 1 -awned. Principal lemma awn from a sinus. Palea 1 length of lemma; chartaceous; 5-7 -veined; without keels. Palea surface pilose. Lodicules 3; membranous; ciliate; obtuse. Anthers 3. Stigmas 2.